The California Institute of Technology is located in Pasadena, California, on the West coast of the United States. It was founded in 1891. Despite its small size, Caltech is a world-renowned science and engineering institute featuring faculty and alumni that have earned national and international recognition, including 39 Nobel Prizes. The Institute manages the nearby Jet Propulsion Laboratory (JPL) for NASA; owns and operates large-scale research facilities such as the Seismological Laboratory and a global network of astronomical observatories, including the Palomar and W. M. Keck Observatories; and cofounded and comanages LIGO, which, in 2016, observed gravitational waves for the first time. HARMONY 2019 will be held on the campus of the California Institute of Technology (Caltech) at the Annenberg building, home of Caltech's Department of Computing and Mathematical Sciences (CMS). There are 5 airports within 30-90 minutes of driving (during non-peak times) from Caltech: LAX, ONT, BUR, LGB, and SNA. The closest airport is BUR (in Burbank), but it is a domestic airport and is served by only a small number of airlines. The most likely airport to be used by international travelers is LAX in Los Angeles, although ONT (in Ontario) is also an international airport and may be an option for some travelers. Caltech is easily accessible from both the Harbor/Pasadena Freeway (number 110), southwest of campus, and the Foothill Freeway (number 210), north of campus. The campus has visitor parking available. Please see our separate campus information page for more information, including a map of parking structures on campus. 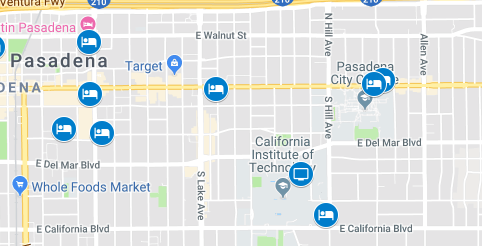 If you are not accustomed to driving to/from Pasadena from the surrounding areas, it is worth noting that the amount of traffic on the roads can be unexpected and distressing. Area residents (including your local organizers) have noticed a significant increase in traffic over the past few years. If you have visited in the past, please beware that your expectations about travel time may need to be adjusted to the new reality. The use of tools such as Google Maps' traffic view is essential to maintaining your sanity on the roads. Sigalert is another excellent traffic information resource. Visit the Caltech transit guide, intended primarily for the Caltech community. You will find Caltech-specific information on everything from transit subsidies to bus routes, which will help to make your public-transit trip cheaper and faster. Send an email to the local organizers giving the postal address you want the invitation letter to be sent to. We kindly recommend you to contact us early in advance, as the conveyance of your letter may take some time. The Caltech Athenaeum has rooms available on-campus, making this the most convenient option if you do not mind the vintage decor and style. Otherwise, there are numerous hotels in Pasadena. We have gathered a selection on this Google map. We have a block of 10 rooms held in the on-campus lodging at the Caltech Athenaeum. Two have king-sized beds, and the rest have queen-sized beds. The price per night is US $201 + 12% tax. To make reservations, contact them by phone at 626-395-8200 or by email at athdesk@caltech.edu. Make sure to mention you are part of the HARMONY meeting. The Constance hotel is reasonably well-regarded and is within walking distance of Caltech, at 0.8 miles. Slightly farther but still potentially walkable are the Hilton, Sheraton, and Hyatt, all of which are quality hotel options. The Saga and Howard Johnson are closer than any of the other options, and also less expensive than any of the others. However, they are a case of "you get what you pay for". Caveat emptor. If you have your own transportation, or you don't mind using a ride service, there are additional good choices that are somewhat farther away (but not too far). Finally, an additional popular option is AirBnB. Pricing and location is unpredictable so we cannot provide much guidance, but here is a link to an AirBnB search for Pasadena during March 25–30.